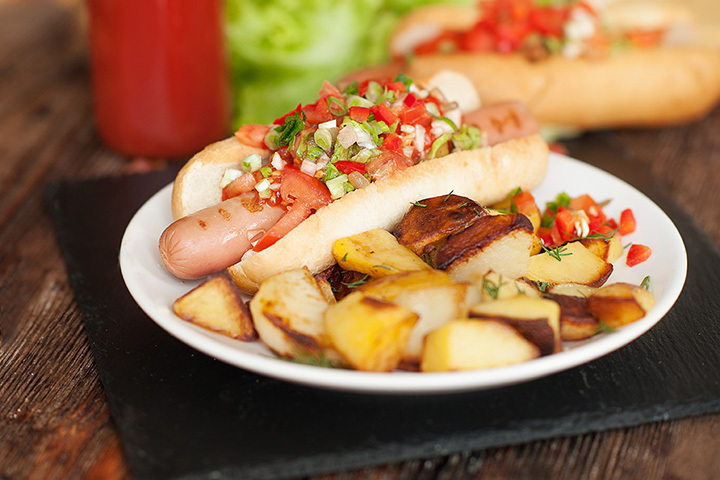 Unless you live in West Virginia, you might not know that there is a particular hot dog culture in the Mountain State. A true West Virginia hot dog has a delicate balance of bun, meat, chili, and slaw to achieve perfection. Some say that once they taste a West Virginia hot dog, they aren't satisfied with any other. You can decide on your favorite from the choices below, but be forewarned: These dogs are addictive! Visitors to Haught Diggity Dogz in Westover, West Virginia, will get a warm welcome and some of the best hot dogs in the state. With a freshly-steamed bun and combining a great balance of sweet and tangy, their fresh-cut cole slaw is a must. Eager eaters can choose their chili topping between mild, medium, and hot for their dogs for one low price. Haught Diggity Dogz also serves hamburgers, fresh cut fries, and ice cream. Set up like a classic 1950s drive-in restaurant, Stewarts Original Hot Dogs in Huntington, West Virginia, is the place to go if you want great food, friendly service, and memorable soda fountain drinks. There are 60 Stewarts restaurants covering the U.S., and the one in Huntington opened in 1932, making it the oldest drive-in in the state. Their famous homemade chili sauce is a great compliment to any hot dog and other condiments are available, including cole slaw. Besides great food, you get a great story behind this hot dog place when you visit. Hillbilly Hot Dogs in Lesage, West Virginia, was opened by Sonny and Sharie Knight in 1999, and the couple expanded their location that's open year-round and included two old school buses. Weenie lovers from all over can take their pick from a menu that includes burger, fries, and a variety of soups called "belly warmers" in the colder months. Choices from the menu include deep-fried hot dogs, smoked Mettwurst, and the very popular Junkyard Dog that's loaded with everything except the kitchen sink. Dave's Famous T&L Hot Dots in Grafton, West Virginia, really is a family joint. Owned by Dave and Barbara Henderson and their kids, the first menu was simple—homemade chili hot dogs, chips, and soda. A lot has changed over the years with this 1950-style restaurant including an expanded menu and new locations, but one thing hasn't changed. Visitors will still find the same friendly welcome and great food. The building that houses The Custard Stand in Webster Springs, West Virginia, may not be historic, but the recipe for their famous hot dog chili is over 100 years old. This chili is so good, it makes up the base for a number of popular recipes and is even available through retail locations throughout the state. Only the best and freshest ingredients go into everything they make, and their appearance on “Shark Tank” helped boost their sales nationally. Lynn's Drive Inn is probably one of the state's best kept secrets. You might miss this quaint out-of-the-way roadside drive-in located in Bluewell, West Virginia, but you won't want to miss out on great food like the loaded hotdogs, foot longs, juicy burgers, cheesy tater tots, or creamy milkshakes. They offer picnic tables for outside dining or you can eat in your car. This is definitely a place to try if you're in the area. Open since the early 1940s, King Tut Drive-In in Beckley, West Virginia, gives you a glimpse of history while enjoying great food. Including their delicious West Virginia-style hot dogs, this traditional drive-in eatery also offers pork barbeque sandwiches, pickle fries, burgers, and the best homemade pies in the area. Local awards include "Top 55 Must See" places in West Virginia and "The Best Drive-In in West Virginia." What do you get when you cross a hometown environment, great hot dogs, and fast service? You get Woody's Restaurant in Fairmont, West Virginia. If you want ketchup, you'll have to ask for it because it's not included otherwise. In addition to the West Virginia-style dogs, they serve pretty great pepperoni rolls and pulled pork barbeque sandwiches. Some restaurant menu items come and go, but the hot dogs, homemade chili sauce, and coleslaw have been the same since the place opened in 1933. Ritzy's in Clarksburg, West Virginia, caters to everyone with a discriminating hot dog palate. This little diner is even open for breakfast featuring—you guessed it—hot dogs! This great little restaurant has it all—fabulous West Virginia-style hot dogs, great barbeque, fresh sides, friendly service, and catering for all occasions. Located in Hurricane, West Virginia, L&R BBQ is known for the family atmosphere and superior customer service. The prices are good, and the portions are will send you home with a fully belly and a smile.